My current lineup: The Trifecta. Top left: Brooks PureCadence 2, still kicking at 226 miles. Top right: Asics Gel Exalt 2, fresh at 3.3 miles. Bottom: My new Nike Free 4.0, exclusively for running errands and running the dog. I have picky feet, that’s for sure. I alluded to my issues with orthopedic alignment in my last post, and that’s what makes finding good shoes a huge task for me every time. D uring the day I wear orthotics – kind of like braces for your feet. They are like hard plastic versions of “Dr. Scholl’s” insoles that were specially molded to my footprint by a specialist. I wear them to treat my “fallen arches,” an uncomfortable situation where the arches of your feet actually touch the ground, or “pronate,” often pulling the knees inward as a result (also called “knock knees”). This messes with posture and over time causes certain muscles or muscle systems to become tight, like the anterior quads and hips, causing further discomfort in other connected areas like the knees and lower back. My orthotics help me a lot – they were an absolute lifesaver when I got my first pair in 2005. Unfortunately, they are too hard and unforgiving to use for sports; they won’t bend and they cause foot bruising upon impact. That means when I need new gym shoes, I’m hitting the store for a very special, very perfect pair of shoes that can essentially replace my orthotics while I’m exercising. No compromise. I will not leave the store with a pair that doesn’t feel amazing, and you shouldn’t either! For the benefit of all, I’ve put together some brief suggestions on how to pick workout shoes, based on different types of exercise and shoe brands that I’ve owned and tried on personally, so you can easily decode the shoe store’s myriad selections. 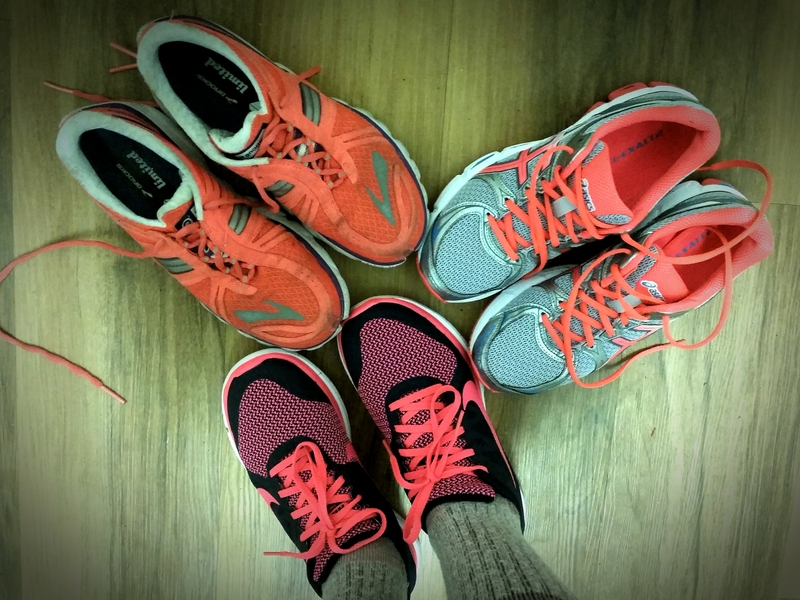 Scenario 1: You don’t run, and need shoes for the gym – lifting weights, Crossfit, etc. Getting your strength on – good for you! Now do yourself a huge favor and don’t buy a new pair of running-type shoes for the gym. Weightlifting is the one situation where wearing Vans or Converse instead of typical gym shoes might actually be a good idea. You want to have a sole that’s as flat as possible, with little to no counter (the distance from where the bottom of your foot lies in the shoe to where the sole actually touches the ground). Most running/training type shoes have at least a little heel counter or even a lip around the sole for stability, and these can easily cause weightlifting accidents if you trip over something or put your foot down wrong. Lifting and Crossfit shoes are starting to come out on the market (my boyfriend just purchased some from Inov8, and has also used the Reebok Crossfit line), but they can be pricey. Stick with your broken-in Vans or Converse until you can commit to a nice, specialized weightlifting shoe. Scenario 2: You’re a beginning level runner, and like to do some things in the gym too. Some basic, lightweight runners or trainers may be right for the beginner, to begin feeling how your muscles work and how your feet feel in the shoe while running. You want a shoe that is lightweight, flexible, and cushioned for maximum comfort. Usually at the store they will be labeled as “Lightweight” “Minimalist” or just unlabeled “Running” or “Training.” The Nike Free is probably the most popular example – these are cute, comfy, and everybody wants a pair, but ask any runner and they’ll tell you they basically only work for beginners as a real training shoe (probably because they literally fold up like a taco and offer little support). Same goes for the Champion line at Target – sorry Nike fans, but in the grand scheme of things, these will do about the same as the Nike Free for a third of the price (obviously sacrificing a little bit of style and comfort here). It’s okay to save money at this stage of the game, because you will probably wear them out with bad running form and be wanting a new pair very soon as your needs start to change. Scenario 3: You’re a beginning or novice level runner, starting to hate the way your soft lightweight or minimalist shoes feel, but still having trouble with proper form. I remember the day I woke up and couldn’t stand my Nike Frees anymore. I finally felt like a real runner! But I soon learned I was far from it. I made a smart choice and assessed my needs before heading to the shoe store. Recently I’d read about the dangers of heel striking, but I was really struggling to adjust my form and suffering from pain in my shins. So I went for the Reebok ZigNano, a cushiony running shoe with traction, a medium amount of support and a GINORMOUS sole and heel counter (Reebok calls it a “crash pad”) molded into the shape of a zigzag, meant to absorb shock from a heel strike and guide the foot forward in a correct motion. These shoes really helped me to stop heel striking, but after that, the large heel counter and heaviness of the shoe quickly became more of an annoyance as I wanted to start running faster. Scenario 4: You’re an amateur runner, perfecting your form and beginning to recognize your own specific shoe needs. Once you know your body and your running form a little better, the possibilities are endless. You may, at this time, want to switch back to a minimalist shoe just as a change of pace, and to keep your feet feeling lighter as you start to increase speed and distance on your runs. Upon wearing out my ZigNanos, I opted for a fresh pair of Under Armour Toxic 6, a super-light shoe with a stretchy neoprene upper and side-lacing for increased arch support. These shoes were pretty amazing and comfortable, but I could feel them wearing out fast and getting soft rather than springy, and I had just a matter of months to break in a new pair before my first-ever half marathon race. Brooks, a reputable running brand, has this cool Shoe Advisor tool on their website to help you find a good shoe for your feet. Scenario 5: You have your first race coming up and are starting to really pack on more miles. There comes a time when you’ll want to graduate to a structured shoe, often labeled “Stability” at the store. These shoes are typically super-hard to the touch (especially in the heel cup – squeeze the back of the shoe to determine just how structured it is). You’ll also want to check for a bend in the sole. The shoe should hardly give at all. These are going to hurt a little to break in, but it will be worth it when you are putting in those painful road miles during your race! You’ll probably want a “real” running shoe brand at this stage over a consumer brand like Nike or Adidas. When you buy a more expensive and running-specialized brand, these are not just shoes that you throw away after awhile, they can literally last hundreds and hundreds of miles. My first pair of structured shoes were the Brooks PureCadence, and over 200 miles later I still have them! They have a nice high arch, which seems typical of Brooks (one pair I tried on actually hurt, the arches were so high). They also have a little heel counter to continue assisting with heel striking. However, I do have another half marathon race coming up in August, and I recently started feeling a lot of toe room in my broken-in Brooks, causing some extreme blistering the likes of which I’d never seen. Yes, even after 200 miles in a pair of shoes they can just start giving you blisters. This, to me, just shows how much my body is changing in response to regular runs. I decided to listen to my body and for the first time in my life I went down half a shoe size and went for the Asics Gel Exalt 2, a delightfully structured shoe with a soft pillow-y tongue so I can really tie them up tight. The smaller size is really hard to get used to so far, but I can tell these are going to be great fitting shoes for the next few years that won’t give me blisters during my race. Other great specialty brands for serious runners are Skora, Newton, and Saucony. It can be tough not to automatically go for the “cute and comfy” Nikes, but hopefully I shed some light on what really makes a great shoe and gotten you excited about picking out your next pair. In a sport that takes place 100% on your feet, your decision counts. Aren’t shoes fun? awesome! try on everything in the store and annoy the salespeople, that’s how i do it! Okay uhh so im kinda stalking your blog now (in the mall parking lot :p) and its fantastic. Youre a rockstar. Pingback: Pounding the Pavement | Herbs & Spices.